It was one of those Fridays where the needle of time had to be threaded precisely for everything to work out. I had a ticket to see Jonathan Richman at Shank Hall. He was scheduled to play at 8 p.m., and judging from a previous experience seeing him, I figured the show would probably start on time. I was also planning on getting a fish fry with a few friends, some of whom were coming from the Madison area. If we ate in Milwaukee, they likely couldn’t make it until 7. It almost seemed like too close of a call. Although there are a few places within walking distance of Shank Hall where we could have gotten fish, I’ve already written about most of them, including Victor’s, County Clare, and Points East Pub. I suggested I could drive a bit towards the Madison area so we could eat earlier. My plan was to blaze back to Milwaukee afterwards, just in time for the show. 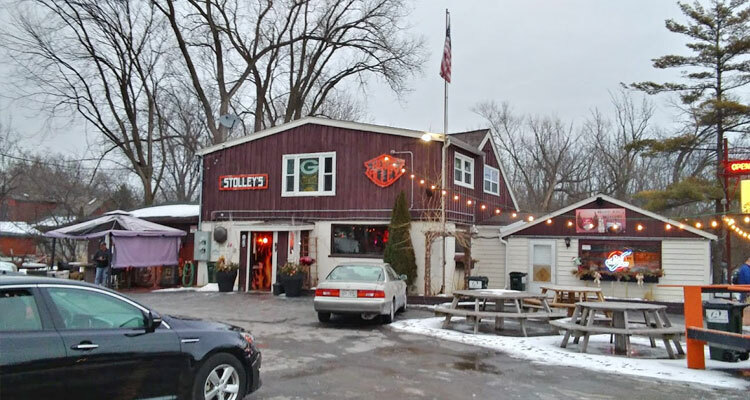 We settled on Stolley’s Hogg Alley (2008 Venice Beach Rd., 262-646-5652), a place right off of I-94, sandwiched between Upper and Lower Nemahbin Lake, close to Delafield and Oconomowoc. I had become aware of the place after it was featured in We’re Here For A Fish Fry! I left Milwaukee at 2:15 to beat Milwaukee traffic, worked in a coffee shop in Delafield for a few hours, and walked into Stolley’s just after 5:30. One of my friends had arrived shortly before me and had already put in our name for a table, so I went straight to the small cube-shaped bar and ordered an Old Fashioned. Arms called for drinks from all directions, and the two bartenders were doing all they could to keep up. Needless to say, the place was packed. The drink was muddled with cherries and an orange slice, bitters, and a red syrup. It was towards the sweeter end of Old Fashioneds I’ve had, but was quite good. I held onto it tightly and made my way to my friend, who was standing in the only place where there seemed to be any room, by some gambling machines next to the kitchen entrance. My friend had been told it would be about a 45 minute wait, so we casually drank and watched fish frys being brought out of the kitchen past us. The area we stood in was on the edge of the smaller dining area, adjacent the bar. The main dining area was a few steps down in a room connected to the main building. By 6:15, the rest of our party had arrived. As the clock ticked past 6:30, a four-top table nearby us was cleared. We saw our name had made it to the top of the whiteboard, and being that there were four of us, assumed that the table would be set for us. Just then, three people sat down at the table. They asked a worker if the table was for eating or waiting, and after being told it was for eating, they told the worker they had put their name in earlier, and the worker relented and let them take the table. Their name, which was a handful of spots down the list, was then crossed off. Like most things in life, I found this episode comedic more than maddening. My friend who had put our name in was a bit pissed, however, and loudly declared, “I guess you can just take whatever table you want and lists don’t matter!” Five minutes later we were seated at another table. Friday fish frys are served at Stolley’s from 11 a.m. to 3 p.m., and from 4:30 p.m. to 9 p.m. Fried fish options include cod ($11), bluegill ($12), perch ($12), and walleye ($13.50). Baked cod is also available with four different seasoning options. All of the dinners include potato pancakes, hand-cut fries, or both; rye bread; coleslaw; and German potato salad. Three jumbo fried shrimp can be added to any fish fry order for $2.50. Clam chowder is available by the cup ($2.50) or bowl ($3.50). I almost went with the bluegill because it appeared in We’re Here For A Fish Fry! and was used for its poster, but ended up going with my usual, cod, and added a cup of chowder. We were brought small bowls of coleslaw and German potato salad, and a plate with small half slices of rye bread. The chowder arrived moments later. Consisting almost entirely of cabbage, except for a few slivers of carrot, the coleslaw was extra crunchy and had a bit of a bite to it. The German potato salad was homemade and had been in a Nesco roaster on a counter in the back of the dining room. I don’t often have German potato salad, but it was fine, and seemed to be made up of the ingredients that are usually associated with it, such as potatoes, bacon, sugar, and vinegar. The bread was a very soft marble rye; there seemed to be a little salt on its edges. The chowder had an extra thick consistency and a fair taste, with an average amount of clam and vegetables. The fish plate came with a healthy portion of fries, a pancake, and four medium-sized pieces of cod. To know someone actually spent time cutting the fries already made them noteworthy, and they were quite good as well, although I did like the pancake more. It was on the softer end and held together well, while still being a little stringy on its interior. Some green herbs were also evident. According to We’re Here For A Fish Fry!, all the fried fish at Stolley’s has the same coating: it is first dunked in a beer batter and then given a little bit of breading before being deep fried. I found the batter thin and flavorful, although perhaps a bit on the saltier side. The flavor was reminiscent of what you would find on fried chicken, but it was less textured and not as crunchy. Although the fillets were moderate in length, they were quite thick, and the meat was of an excellent, flaky quality. A large bottle on the table was filled with dense, sweet tartar sauce, which knocked the saltiness out of the fish, for the most part, for an overall nice balance of flavor. It was 7:25 and I knew I had to hit the road in order to make it to the show on time, so I threw some cash at one of my companions and ran out the door. The clock struck 8 as I drove past Shank Hall, but there was nowhere to park, and I didn’t end up walking into the club until 8:20. Richman was already on stage, and I quietly asked a bouncer how long he had been playing. “He just started,” they answered. I chuckled when I realized that if our table hadn’t been stolen I likely would have seen the whole show. Takeaways: The place is a biker bar but there really weren’t that many bikers; sweet, muddled Old Fashioned; you can get fries and a pancake at the same time, both of which are homemade and very good; you also get homemade German potato salad; crunchy slaw; small rye bread; above average fish: both the batter and fillets were of a high quality, but the batter seemed a little salty to me; sweet tartar in a big bottle; be careful walking to and from your car if it is parked on the road and not in the parking lot, or you may become a fish fry martyr; someone went all Christopher Columbus on a table and we got skipped and I missed the start of the Jonathan Richman show.